Bob Dempster calls himself an average taildragger pilot, but this is a gross understatement. Bob and his co-pilot wife, Diane, have flown their 1947 J-3 Piper Cub back and forth to Lock Haven, Pennsylvania, over a dozen times. They also have shipped it to England and flew to Egypt, and later they flew from Seattle to the Dominican Republic and Puerto Rico—and back. 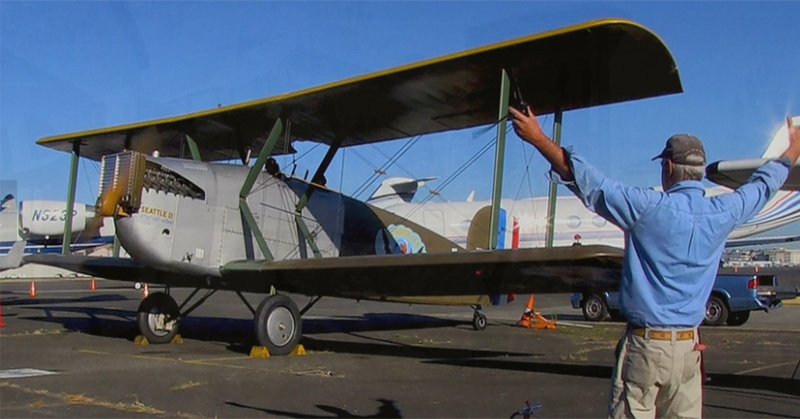 Bob has also flown a Waco biplane at Boeing Field for Olde Thyme Aviation, giving scenic flights. As aviators, artists, and world travelers, Bob and Diane are about to celebrate history by flying a reproduction of a 1924 Douglas World Cruiser around the world, starting in April 2019. For the past 18 years Bob and Diane have been busy with the project of a lifetime. The Seattle World Cruiser Project celebrates the first circumnavigation of the globe by air, and Bob, Diane, and volunteers have built a reproduction of the 1924 Douglas World Cruiser flagship named Seattle that embarked on the journey in 1924 with three other World Cruisers. Unfortunately, the Seattle didn’t make it. The plane and its crew crashed in the Alaskan Peninsula, and their dream of circumnavigating the globe came to a halt. The other three aircraft flew to England with two of the original airplanes finally reaching Seattle. After a fateful conversation with then Museum of Flight Curator Dennis Parks and President Ralph Bufano in 2001, Bob made the first step in his Seattle World Cruiser journey by establishing the Seattle World Cruiser Association, a non-profit that—with the help of volunteers—built a reproduction of the Seattle with the intent to celebrate the original global flight. Prior to establishing the non-profit, Bob and Diane had several decades of experience flying to far-flung locales. In the spring of 1994, they modified a Piper Super Cub by adding a basic IFR instrumentation and a 60-gallon fuel tank before a two-year journey that took them to England and then Australia via France, Italy, Greece, Egypt, Bahrain, UAE, Pakistan, India, Bangladesh, Burma, Thailand, Malaysia, Indonesia, and Tasmania. After Australia, they reached Japan via the Philippines and Taiwan. Unfortunately, they had to ship the Super Cub home from Okinawa to Seattle due to technical difficulties. Bob’s passion for aviation and penchant for problem-solving, along with Diane’s unwavering support and curiosity, make them the ideal crew for carrying out the Seattle II’s global flight. Rather than being nervous or anxious about what the journey might bring, Bob relies on his years of aviation experience and survival mindset to meet the challenges. Bob reflects,“It will actually be a lot easier because the focus will change when we depart. Whereas now I have 1,000 different things going on, we can shift gears to just flying the plane.” That, he laughs, will be enough. While Bob admits that weather will be a potential delaying factor, he’s prepared with alternate plans, extra equipment, and survival gear, like ocean life rafts and satellite communications devices. Bob and his enthusiastic volunteers—whose skills range from mechanical and electrical engineering to welding and woodworking—are putting the finishing touches on Seattle II before its global flight in late April, 2019. You can keep up with the World Cruiser Project’s progress at seattleworldcruiser.org. Want to learn more about historic planes like the Seattle World Cruiser? Check out the aircraft we have at the Museum!